Flight Schedules: Enter any two airport codes and see the flight details including scheduled time, actual time, terminal, gate for departure and arrival cities. Security Wait Times: TSA Wait which shows you average and maximum time in minutes that you will be waiting in the TSA line. Gate and Times is another great feature to find out your airport routes. If you are either travelling or picking up or dorpping off someone, or have anything to do with Airport schedule tracking this is a godsend of a utility app, for iPhone/iPod touch owners. Note: Some people have complained of crashes in this Travelocity app. If you don’t want to download the Travelocity app, you can always just go to iphone.travelocity.com on your iPhone via Safari and you’ll get an optimized view for the iPhone. AppSafari review of Travelocity was written by Joe Seifi on December 7th, 2007 and categorized under App Store, Reference, Search, Traffic, Travel, Utilities. Page viewed 6517 times, 2 so far today. Need help on using these apps? Please read the Help Page. 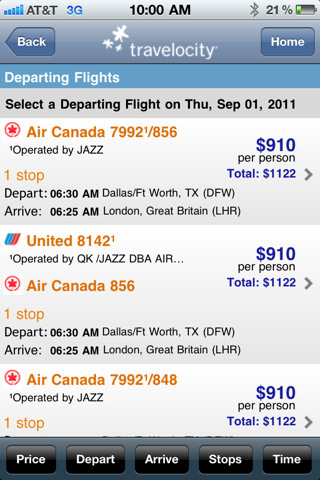 you should check out the newest version of the Travelocity iPhone app (v1.3). it’s even better.